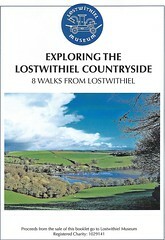 The booklet, 'Exploring the Lostwithiel Countryside', is still the centre stage theme for the current museum window display. Deborah Clough has done an excellent job of highlighting this 'walking through history ' theme which has attracted visitors into the museum to buy the booklet & also to see what other gems we have to offer. Our thanks to Jeff Pearce from Mellingey Cottage, a luxury holiday cottage business, for his generosity in sponsoring this window display. Towards the latter part of August the subject for the window display will be a timely one featuring the Suffragists and Suffragettes movements. A special thank you to Amanda Davidge & Rebecca Bettin of Lostinbooks, a business based in Choughs in Fore Street, for sponsoring this new window display.